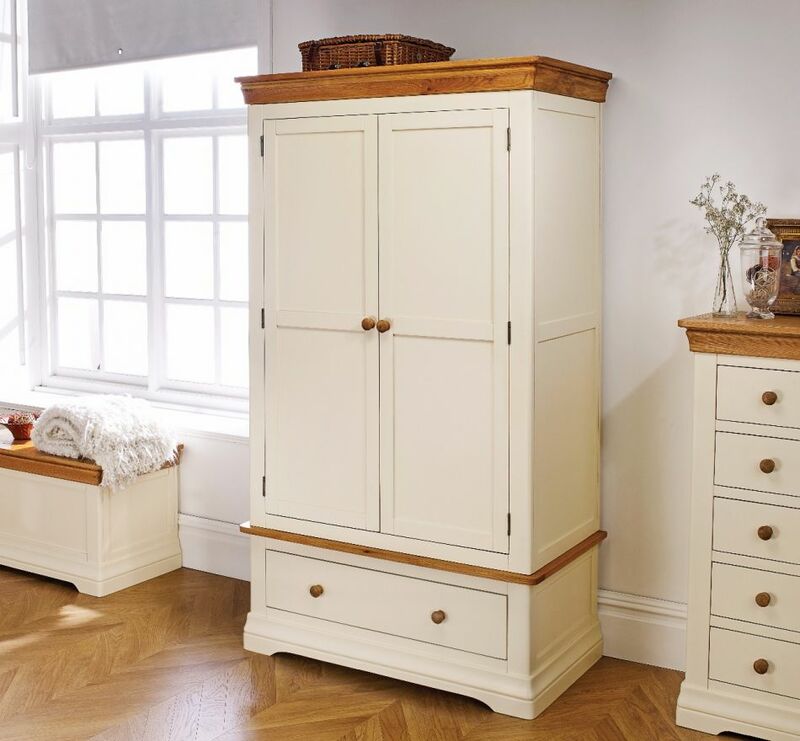 The French Farmhouse double oak cream painted wardrobe design is made with an American oak top that combines really well with the French Farmhouse detailing and styling that give it the real wow factor to transform a bedroom. Handmade exclusively for Top Furniture with the rounded edge detailing on the upper and lower corners. You get a huge amount of storage space behind the two door panels to hang your clothes on an internal rail. The lower drawer unit offers additional storage space. 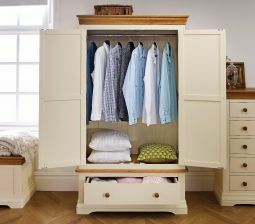 Please note that this wardrobe requires some assembly for the upper section which has now been added as an optional paid service on the checkout page for most postcodes. The lower drawer unit for the wardrobes comes fully assembled in its own box but the top section would be too large for us to deliver into most homes if it came fully assembled in its own box. Excellent wardrobe well made and easily assembled with limited amount to be done, also very helpful delivery guys. Thank you. Superb design and quality for the price. Very pleased. Some assembly required but advantage was easy to get upstairs. Front door section pilot holes not drilled deep enough so had to drill a further 4mm otherwise screws would have sheared during tightening. No problem! Fantastic quality & price, i cannot believe the price i have paid for all of my bedroom furniture. Wardrobe comes with the base already built & then you put together the front, back, sides & then fit the top, i did this all by myself, it was that easy & it took me about 1.5 hours!! I would highly recommend this wardrobe, you will not be disappointed. We're very pleased with our wardrobe. Good quality and excellent delivery at a reasonable price. Thank-you Top Furniture. The only thing preventing a very good rating was an imperfection in the oak wood panel on top of the wardrobe. Not bad but annoying and should have been spotted by quality control. Otherwise everything else was good. It was well packaged and delivered reasonably quickly. We got it in a sale and consider it was good value. At the full price not such good value really. I could have reported the imperfection but didn't want to have to wait for a replacement. It's bigger than I expected, the wardrobe is really spacious, I used to use a metal clothes rack jammed full of clothes and it all fit into the wardrobe with 14"/16" to spare for even more clothes. The draw is deep enough for me to stack 4x folded up track pants on top of each other and 3x stacks side by side. The Base unit was delivered in one piece, the top arrives in 5 piece's 2 sides, 1 back, 1 front and the top edging and believe me when I say it's so easy to put together 30 odd screws with pre drilled holes so no messing around just push them in and tighten them up. It also included the hex Allen key to tighton the screws up. Delivery guys were great and delivered it to the room I wanted it in. Another great item from top furniture and £100+ cheaper than all the other retailers I've looked at for the identical item. Thank you. 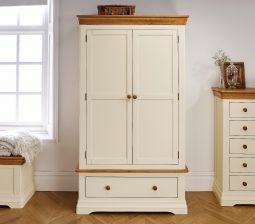 I am very pleased with my recent purchase of a Farmhouse Country Oak Painted Double Wardrobe; it was easy and straightforward to assemble and is a solid and sturdy piece of furniture with great storage capacity. It has a rustic feel and attractive finish which its description accurately reflects, and is excellent value for money. The delivery was smooth and punctual so I would definitely recommend this product. Absolutely a pleasure to receive an item that was in good condition, easy to put together and looks great. Delivery spot on and wardrobe spot on, would highly recommend. And it smells nice. Fits perfectly in my tiny house. Very happy with quality and styling; exactly what we wanted and expected. Well made furniture at a reasonable price, excellent firm to deal with, came on the day and time advised, would defiantly use them again. Delivery men a bit reluctant to hump the furniture up the stairs to the bedroom but they took pity on two old age pensioners and took them upstairs. Two big strong men struggled in getting them up the stairs, they are solid pieces of furniture extremely well packaged. The delivery men are a credit to the company, not a job I would like to do. We plan to refurbish another bedroom and will be ordering more bedroom furniture from them. I was told a 7am delivery and on the dot it arrived. My new wardrobe is stunning. It is solid and is the starting point of my new bedroom. Umm think I might just have to order the matching bedside cabinets too !! Good value and a beautiful finished. Beautiful wardrobes. I have Been looking for a cream coloured bedroom furniture set to match my bed. Along with this I bought the triple wardrobe and matching dressing table set and the bedside table. Highly recommend, looks better in reality than the photos. Very pleased with the wardrobes. Quality and delivery very good. 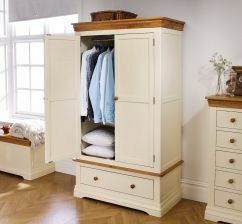 This wardrobe comes in 2 cartons, one containing the drawer base, the other the flat packed wardrobe unit. This makes it easy to transport if stairs are difficult. Assembly is easy and when together the whole unit is strong.Being made of wood it is repaintable and repairable unlike most flatpack furniture. Good value, recommended. Just wanted to say I love my new wardrobes!!. Purchased two of these was worried about part assembly but it couldn't have been easier, my husband and myself took our time and done it in 2 hours. Lovely quality looks great in my bedroom with bedside tables and chest of draws. Thanks Top Furniture. Items were very well packed and easy to assemble. Overall very pleased with our purchase. A very well made product. Easy to assemble using clear instructions. 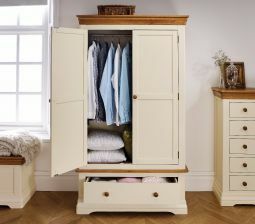 Well priced for such a sturdy and robust wardrobe. Far better than the wobbly flat pack junk available from most diy and Scandinavian outlets. Suits our house and most importantly my wife! Very pleased. Beautiful, stunning wardrobe. Very well made, solid. Very pleased.